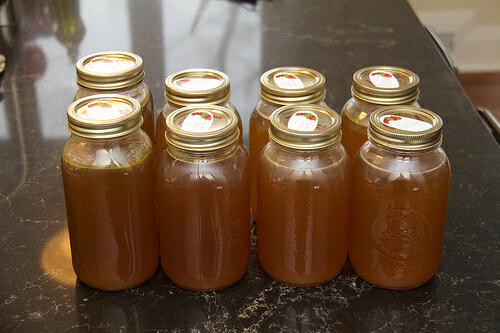 Pressure canned chicken stock for the pantry. Now that the holidays are over (which I mostly missed due to the cold from hell) I’m chipping away at my maternity prep to-do list. One of the biggies was to devote a weekend to cooking a whole bunch of meals for the freezer, to help ensure we have lots of food easily ready to go when little baby chaos arrives on the scene. Among the items to be prepared was a new batch of pressure canned chicken stock, using the carcasses of roasted chickens past that I’d kept in the freezer. It’s the first time I’ve used my pressure canner at the new house, and let me tell you once again I appreciate the design decisions we made in my new kitchen. I’ve posted about pressure canning stock before, so I won’t repeat myself. It just takes a bit of planning and the right equipment. While some people think it’s a lot of work, the only real extra work is the time pressure canning takes. It takes much longer to process pressure canned goods, but the benefits are so worth it. I love that my stock doesn’t need to take up space in my freezer, and that I don’t need to thaw it before I use it. It’s just there and ready to go. If my energy levels keep up with my ambitions, I’ll try doing some full on soups, perhaps in some 500ml jars (meals just for mama). So far I’ve only pressure canned stock and tomato sauce. In addition to the stock, I cranked out four large lasagnes, four cabbage roll casseroles, seven chicken pot pies, and a half dozen calzones. Chicken Pot Pies (pre-pastry lids), including one for dinner this week. All of these meals lend themselves really well to doing in large batches. 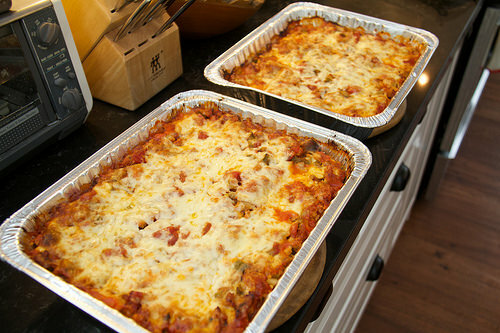 Make a giant pot of meat sauce and turn it into lasagnes. 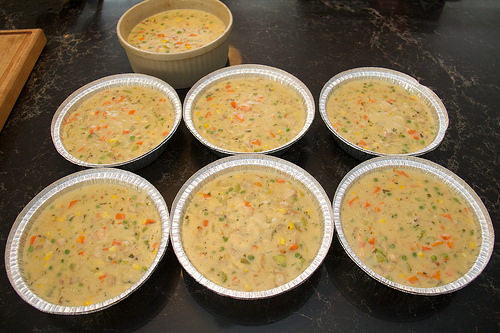 Make a giant pot of chicken pot pie filling, divvy it up and let it cool before adding pastry lids and then freezing. I almost got worried that I wasn’t going to have enough room for all these in my freezers! Planning my time was key here — I started the chicken stock as soon as I got home on Friday night, and by the time I went to bed it was ready to go into the fridge to cool. I also washed my jars and got all my equipment ready. First thing Saturday I strained the stock and got it heating again on the stovetop, along with my jars sterilizing in another pot. Since I can only get 5 1-L jars into the pressure canner at a time, I did two batches, which admittedly took the better half of the day. I got some pizza dough going in my bread maker for the calzones, and filled and then baked those in between canning duties. By late afternoon I was prepping for the next day: chopping veggies for the pot pies, shredding cabbage for the casseroles, and I even had time to cook the meat sauce. This meant that Sunday was basically just assembly and baking (or in the case of the pot pies, cooking the filling). I was pooped by the end of the day but it felt great to stock up on all these meals. My friend Angie, expert new mom that she is, suggested a couple of burrito recipes that look like they’d make for great breakfasts and lunches for a busy new mom. I’m planning to stock up on these a little closer to my due date. Thanks for the link! You’re a freezer-cooking rockstar!